In her article Dela von Boeselager researches the history of the donation of vestments to the Madonna of Teltge, a place of pilgrimage in the diocese of Muenster in Westphalia. A series of written sources, previously unknown, now let us recontruct the story of this votive gift. Today fragments of the vestment in question can be found in the Museum "Heimathaus Muensterland" at Teltge. 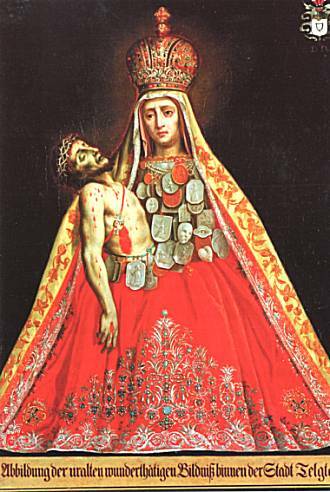 Since 1854 the vestment was out of use because of a renovation of the statue of the Virgin and the fabbric probably was given as relics to pilgrims piece by piece . In the museum the 58 jewels sewn on the velvet are still completely preserved. The city of Teltge was the most important place of pilgrimage in the diocese of Muenster in Westphalia. A chapel was built and regular processions were introduced. As a result the prigrimage to the Pieta was very much booming from 1654 to 1657. Since 1719 it was the archbishop Clemens August to reign in this diocese and he promoted the worship of the Madonna in this place. (He was one of the sovereigns who had a right to participate in the election of the emperor, and in German his title was "Kurfürst"). When his mother Therese Kunigunde passed away on March 10th, in 1730, he donated the embroidered vestment in question to the statue of the Madonna. The jeweller Barre set up 58 turquoises from Clemens August's mothers jewels on flat rings with small eyes in it for sewing them onto the fabbric. 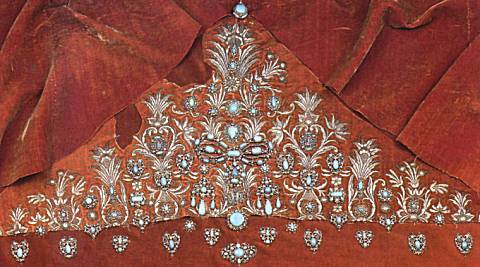 The gold embroiderer Anton Schicker (or Schecker) was commissioned to insert them in the metal embroidery on red velvet. The payment accounts of these 2 craftsmen date from 1732. The handing over of the vestment was recorded by Joh. Matthias Rieve in 1734. The Madonna was supposed to wear the vestment at the 4 festive times every year and afterwards it was to be locked up in a iron chest. It was Baron Johann Wilhelm von Twickel (1682-1757) who had an oilpainting made probably before his death in 1757. The question whether the jewels once belonged to the bridal jewels of Therese Kunigunde is not cleared yet. Dela von Boeselager did not find any proves for this. Turquoises were popular in the Ottoman Empire. In Europe of this time diamonds were more in fashion. The jewels could have been donated to Therese Kunigunde by her husband or by her father. Both were much clelebrated as conquerors over the Turks. The question was already raised in 1976 in Hubertus Glaser's calalogue of the exhibition on the "Kurfürst" Max Emmanuel (the prince of the Holy Roman Empire had a right to participate in the election of the emperor - the German king. Beginning around 1273 and with the confirmation of the Golden Bull of 1356, there were seven electors: the archbishops of Trier, Mainz, and Cologne; the duke of Saxony; the count palatine of the Rhine; the margrave of Brandenburg; and the king of Bohemia).